Scientists "know" that faster programs is better. But what does this mean? First, most of the time you will spend more time writing programs than running them. All the previous talks optimize writing, debugging, collaborating, and maintaining programs and is the most important thing you can do. Profiling: A form of dynamic program analysis that measures time (or space) usage of a program. Faster is better. But what part is slowest? Usually writing, debugging, collaborating, maintaining. 10% of code is 90% of run time. You only want to work on that 10%, but what 10% is it? What this saying means is that you should not try to optimize your program before writing it. Programs are very complex interactions between processor architectures, memory, multiple layers of caches, compilers, and the instructions themselves. If you try to guess where the slow part is, you will probably get it wrong and end up wasting your time. Wikipedia: Profiling is dynamic program analysis of time, space, or other resource usage. This talk focuses mostly on time profiling. Profiling will help us find bottlenecks in the code, that use up most of the time. We then work on the code around the bottleneck. Computers and programs are very complex, with many subtleties in processor pipelines, caches, compiler optimizations, and so on. The actual program speed can't always be easily predicted from the code itself! This is the point of profiling first, then optimizing. 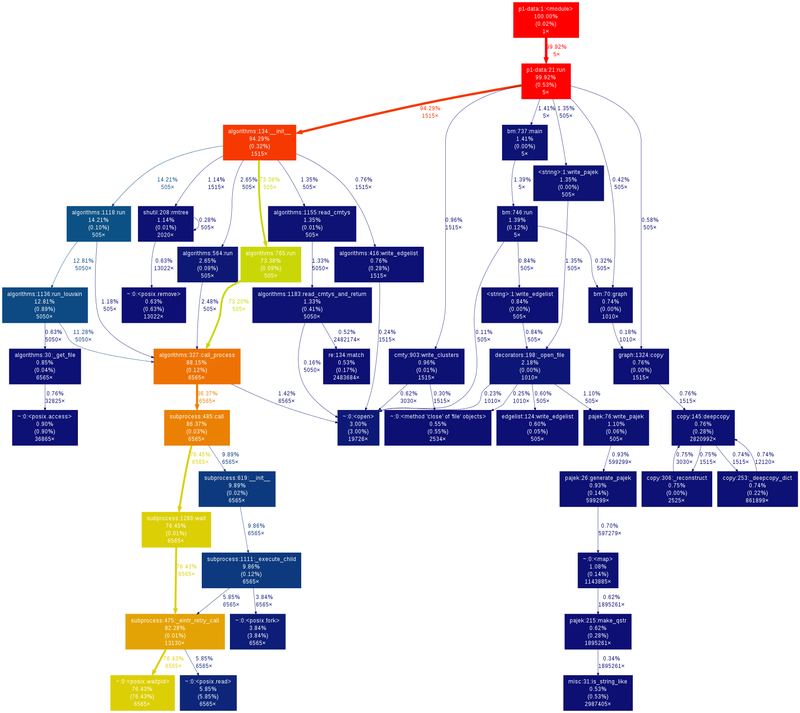 Call graph: directed graph showing which functions call which. It can (like this one) also have time information associated with it to make it a time profile. 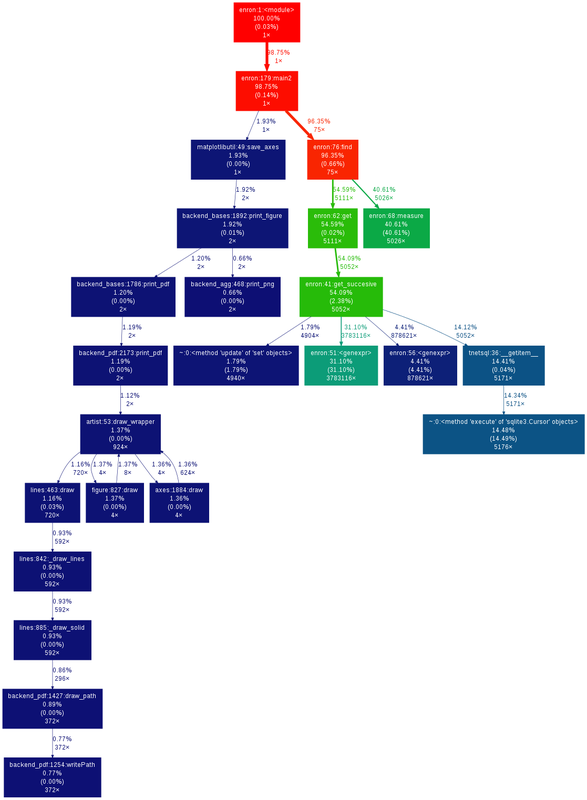 The image linked here is an example of a profile call graph from my work. Let's examine it. I find one slow branch that takes most time. This is a directed graph showing the flow of time through the program. At the top is the entry point, and looking down you see the flow of time (in fraction of total time) distributed among all functions. Colors serve as a visual aid to see where the hot spots are. Arrows point from callers to callees, and include number of times called. This is not "a profile". This is one representation of a profile. Step 1: have a good, clean program that works correctly. Remember, the whole point of this is that you should write good programs first, and then profile. Of course, sometimes you will profile during development, but don't go crazy sacrificing readability for optimizations. Chances are that will be refactored out later anyway. Other languages are similar, some other language examples are later. In the first step, we run the program using the cProfile module. This just stores up the profile information, and we will examine it in the next step. python -m cProfile: Run library module cProfile as a script. -o profile.out: Tells cProfile to write the profile to the file profile.out. SCRIPT.py arg1 arg2 ...: Your normal python interpreter arguments. The output profile.out contains details of all function calls and times. The next step is to visualize or analyze the data in profile.out. I personally prefer first running and storing the profile in profile.out, and then visualizing, to be better. If the call graph is not useful enough, I can visualize it again using different options or examine it using the command line for more details. Also, if I make a change, I can compare the new and old profiles to see how it affected things. This is important! python -m MODULE is the same as "python /path/to/the/MODULE.py". It is a common shortcut. This step works on any platform. 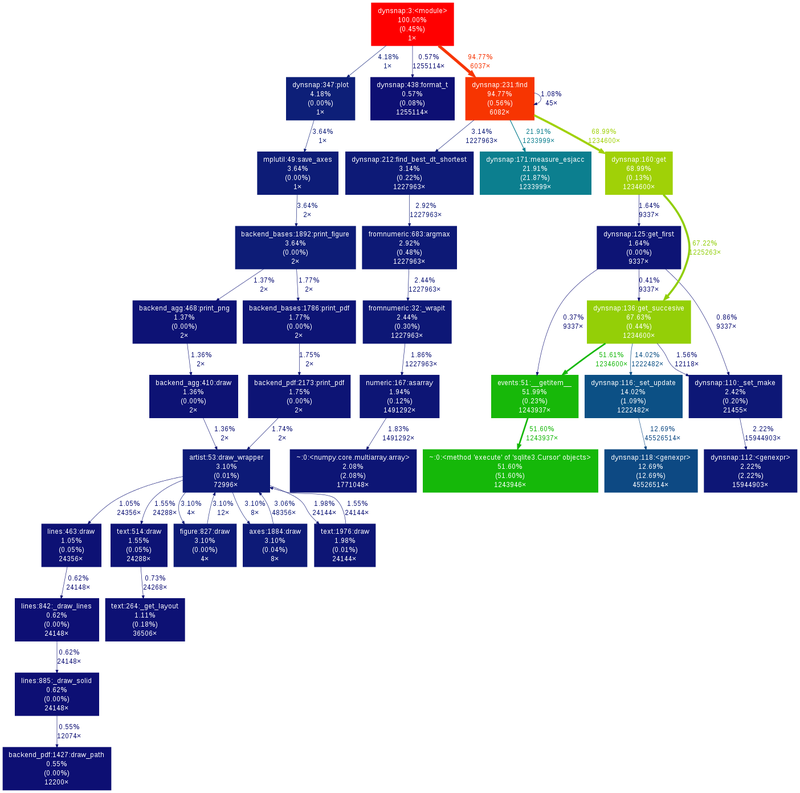 gprof2dot.py is a call graph visualizer. It is my main tool for profile visualization. It takes the profile.out and converts it to a call graph in the graphviz language, which can then be visualized or analyzed in different ways. You then use graphviz (dot) to make a picture. This command runs everything and displays the output all at once. This creates and displays the PNG all in one go. This assumes that you are on Linux, or some operating system with pipes, and graphviz installed. There are graphviz tools for other platforms. If you want to save the image, change |display to > profile.png. Total time: time spent in a function itself. Tells you that the code in this function is taking a lot of time. Cumulative time: time spent in a function and all functions it called. Tells you that this function is taking a lot of time. Perhaps it is calling other functions unnecessarily. Callers: functions which called some function. Callees: functions which some function calls. What functions take most time? Who calls the functions that take most time? Often, the actual critical function is several steps up. (in Python) some C-implemented functions or methods do not appear. You generally want to find things that are surprising: that are using lots of time but shouldn't be major operations. You want the actual computation part to take most of the time. Each time you improve some things, re-generate the profile to see changes. There are also tools for line-based, instead of function-based, profiling. However, due to the overheads of Python it's not common there. I don't have magic suggestions on how to improve things. After seeing enough profiles, and a future optimization talk, you will gain intuition on how to do things. Most importantly, by examining profiles before and after your changes, you will be in a position to know what works and what doesn't. Here, you see two call graphs: before and after optimization. Then, notice that the "hot" branch slows becomes less important, and we see that its importance greatly decreases, and many other branches appear. By default gprof2dot has a node time threshold of 0.5%. Profile sources: before and after. 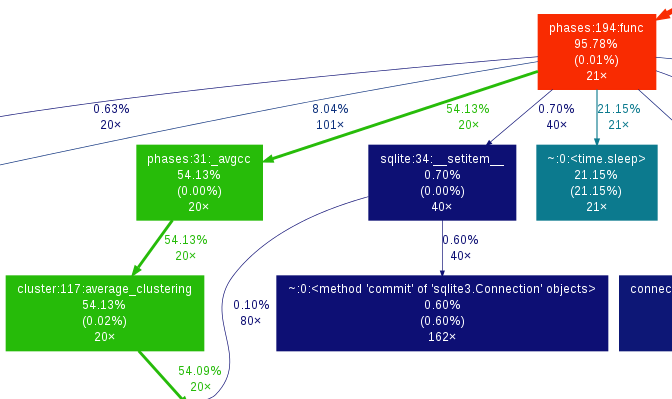 On the left of this figure, we see various external community detection methods running using the subprocess module. You can examine the raw profile.out data using the command line, without making a picture. sort the data by total time, cumulative time, or any of the options. Print functions which called funcname and how much time was spent in calls from each function. Let's study the difference in total time and cumulative time by looking at profile-external.out. Now, let's sort it by cumulative time (sort cumul). You see that the <module> takes up all the time, as you expect. I just know what files most of these functions are in. If you see a file name that you don't recognize, like misc.py, restart the profile browser and don't run strip and you will see full file names. Different compilers can have different options. You will then find a file gmon.out with the profiling data. View it with gprof: gprof a.out gmon.out. The interface is like the Python command-line profiling. You can also use gprof2dot in the same way as Python, without -f pstats. C code must be compiled with profile support, and then it automatically appears when you run it, unlike Python where you run it differently to invoke the profiling hooks. C (and other compatible compiled codes), in general, has a whole lot more instrumentation capabilities. Self explanatory, fraction of time in this function. Seconds spent in this functions code. Seconds spent in a function and functions called by this function. As we can see, this is pretty similar to the output from the pstats command line browser. You can also use gprof2dot on gmon.out, as well as lots of other tools. Deterministic profiling: Trace every function execution and return and record all times. Introduces overhead in every function call. More accurate in that it records every function call. Statistical profiling: At random intervals, record the program's call stack. Less overhead in the execution. More accurate in that it won't affect the runtime so much. oprofile is a suite (with Linux kernel module) that can do this on already running code (C only). Everything in this talk uses deterministic profiling, and probably it is the main thing you will use. However, you should know that there is a wide variety of techniques behind profiling, including some serious tools for dynamic program analysis. If you ever have a program with mainly small, fast function calls, consider stochastic profiling. Stores pstats output in filename.out for examination in other programs. Leave off filename argument to just print it. IPython has a shortcut for running this. I would usually save it to another file and visualize with gprof2dot.py. Prints a profile to the screen. With -D, save the standard pstats output for visualization in gprof2dot or other programs. These tools can make and print the text-based profile all in one go. Perhaps that is useful sometimes from the command line for quick things. For big things, I'd generally prefer to make and save to a file for further analysis. runsnakerun: simple area-based view, for Python. oprofile - system-wide statistical profiler. Memory profiling is tricky in Python. Since objects have shared ownership, you can't tie them to specific locations in code so easily. I have rarely needed to use memory profiling in Python. This tutorial does not talk about optimizing, the process of actually making these things go faster (that's a future tutorial!). Try different methods for calculating stuff. Add a caching layer to save computing things over and over. Use dictionaries well. Algorithmic improvements (future talk). If possible, it's best to replace, not rewrite, these parts. Move just the slow part to C.
There are some optimization resources at the end of this talk. 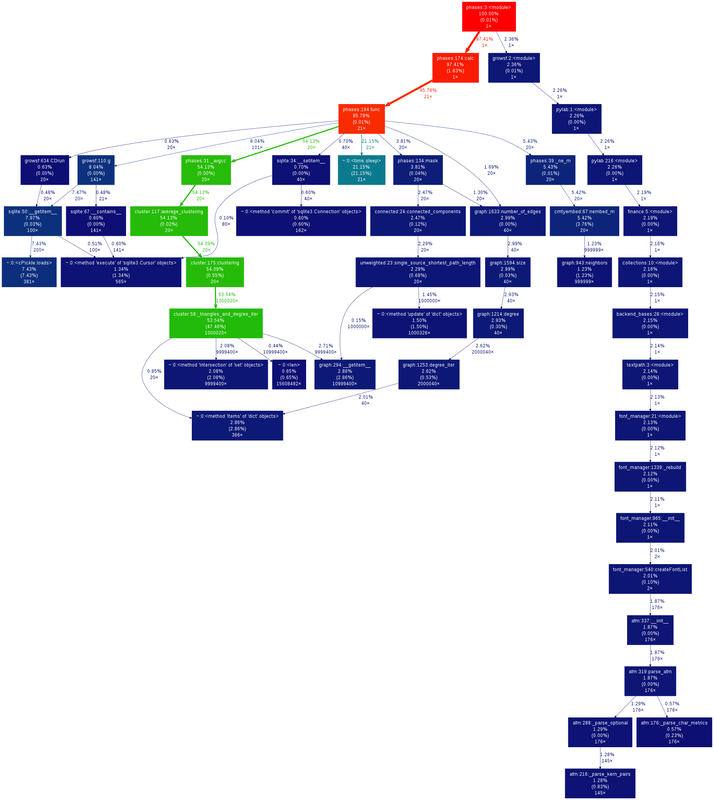 Call graphs represent the flow of time through your program. This talk does not talk about optimizing itself. There is a lot of overhead, so you must specify which functions to profile! RAM usage takes time. Reduce memory usage to improve performance (and scale up).